Water usage determines the bill amount. The average household uses an estimated 2,000 gallons of water per person per month. Outdoor water usage and/or a leak could cause usage to greatly increase. Refer also to the Rates and High Consumption pages. 2. Who do I call if I have a trash-related issue or question? Trash service is provided through Waste Connections and billed by the City of McKinney. If your trash or recycling was missed, call Waste Connections at 469-452-8000. Order damaged / missing cart replacement online. Request bulky item pickup online. Email us to order or return extra cans. Associated costs may apply. Request pickup of electronic or household hazardous waste including fats, oils and grease. 3. Do you offer paperless billing? Yes! Options are available for an electronic statement in addition to or in lieu of a paper statement. You can sign up using our online portal (requires an active account) or by sending us an email request. 4. Do you offer autopay? Both draft automatically on the bill’s due date. To avoid payment failures due to expired / compromised credit cards, bank draft is recommended. 5. How do I add someone to my account? To add someone to your account, we will need a copy of their driver’s license. If renting, a copy of the lease is also required and must list the person as a tenant or occupant. Email us the information. 6. Why is my usage the same as last month? Do you estimate readings? Meters are read monthly and are not estimated. Since usage is billed in 1,000-gallon increments, rounded down, and inside usage does not vary significantly, it is common to see similar usage each month. See also "How to Read Your Meter" under Meter Facts. 7. Why did I receive a bill after I moved? You are responsible for water service until you cancel your service or it is “forced off” due to the new customer’s connection. The final bill is for the service period up to that cancelation date. 8. How do I change the start / cancel date of my service? Any change must be emailed by 10 a.m. the business day before the original start / stop date. Include the address and reference number from your original confirmation email. Please do not resubmit a request since the original request may already be scheduled. No charge for the first change if it is received by the deadline above. $40 trip fee if the notification is received after the deadline. $30 service fee for any additional change. 9. Did you receive my request for New / Move / Cancel Service? If you received a confirmation request number, the application was submitted and received. Welcome / Confirmation emails are sent up to three business days after your start / cancel date. 10. How do I know if I have a leak? 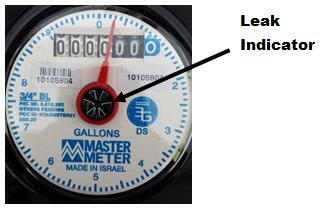 Meters are equipped with a leak indicator dial (see image). To check for a leak, turn off all water (inside and outside). With no water flowing, the dial on the meter is stopped. A spinning dial means water is flowing through the meter. A small drip may not be detected and is not considered measurable. Also see the High Consumption and Leaks pages. 11. Can I change my bill due date? Meters are read and accounts are billed based on geographical cycles; since the due date is based on the bill date, it cannot be changed. We make every effort to bill each cycle at around the same time each month so that the due date does not fluctuate more than a few days. See also Due Dates & Billing Cycles. 12. How can I avoid late fees or disconnects? If paying on or before the bill's due date is not an option, know that we offer extra time to pay before late fees apply or a disconnection is scheduled. See Payment Extensions & Financial Assistance for more information. Update it via the online portal. This requires an active account. 14. How do I change the name on my account after marriage or divorce? To change your name on the account, we will need a copy of your driver’s license showing the name change, the marriage license or the divorce decree. You can submit the information via email or in person.